Red radishes pack a lot of peppery crunch in salads and wraps. They are usually pretty inexpensive, but if you grow them yourself you get to pick them at their peak of flavor. Picked when they are small they are not as peppery. Here is a yummy recipe for crostini that is so simple. You just spread Boursin garlicky cream cheese on slices of baguette. Then press on very thin slices of red radishes. Done! Other simple versions: instead of using Boursin, spread a thin layer of butter, cream cheese, or a flavorful mustard as the base for the radishes. Try other kinds of bread, like good whole wheat bread or rye bread. Discover which version you like best. You can overlap the slices of radishes if you like. Or cut each radish slice in half and arrange them to make a pattern. For a little more color add some snipped green scallions. So good, and not your usual crostini. Come to think of it, you could use this as the start of an awesome sandwich! And you could substitute thinly sliced cucumbers for the radishes if you like. Add snipped fresh dill on the cucumbers. Or serve both kinds: pretty! You can slice the baguette as thinly or thickly as you like and can use a whole grain baguette to be more healthy. Toast the slices or don’t. It’s up to you. If the crostini are not spicy enough for you, just sprinkle on a little black pepper for some extra kick. I love Boursin, but it is a little expensive. Click here for an easy recipe that makes a good clone of Boursin without the high price. Since you’ll be spreading it right away, you don’t need to form it in a shape. Growing radishes is a great project for beginning gardeners. It’s fun trying different kinds and they are easy to grow in the cooler months. Some radish varieties are almost sweet, especially if the weather hasn’t turned too warm. 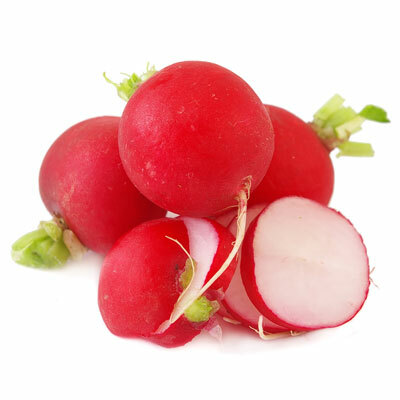 If it’s too hot already to plant radishes where you are, buy seeds now and plant them in the fall!